London’s thriving craft beer scene is the subject of a new documentary, to be screened in a selection of the capital’s breweries, pubs and bottle shops from next month. 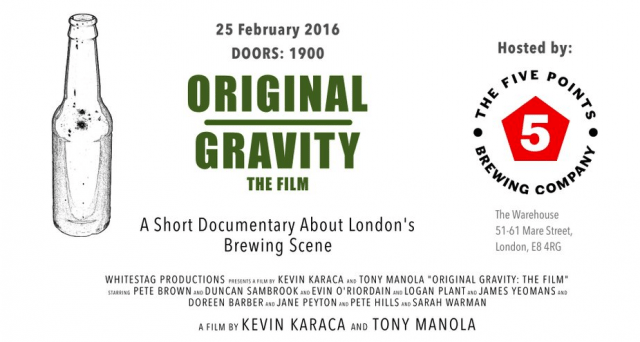 Featuring the likes of Beavertown, Hackney Brewery, Five Points Brewery, The Kernel, Hop Stuff and Sambrook’s Brewery, as well as beer writer Pete Brown, former Beer Sommelier of the Year Jane Peyton and BrewDog head of marketing Sarah Warman, Original Gravity has been produced by beer enthusiast film-makers Kevin Karaca and Tony Manola. It is the first documentary to focus on London’s craft beer scene and looks at how the craft beer movement has developed over the past decade. The documentary is being launched in two parts: the first part will be screened at five different venues in London between February and April. The dates for the screening of the second part are yet to be announced. Original Gravity – The Film (Official Trailer) from WhiteStag Productions on Vimeo.